Today I am still recovering from my big lifts the other day, so any pulling exercises are out for me :/ This is a great opportunity to do a killer body weight workout though, so I have spent a little time thinking how we can up our game today. Normally I use interval training for a period of effort followed by a period of recovery, but today I am going to challenge us to one 2 minute and 40 second long period of activity before allowing recovery. By changing the design like this, we should be able to switch the focus to more endurance-based training. Now, I have done a similar thing before, when I changed the interval to 1 minute, but today is different again. So that we are still changing pace and changing exercises (to prevent boredom), I have placed couplets of exercises together, and the goal is to alternate these 2 exercises continuously for the time period, switching every 20 seconds, without a rest. For beginners and intermediates, you will have rest periods factored in, so don’t worry. Those who are now at a more advanced fitness level can attempt the continuous design and hate me forever LOL! The other evil thing I have done is deliberately choose 2 exercises that will create a significant “burn effect” as the rounds go on, and I am sure there will be a few shoulders on fire by the end of it. To break the workout up, I have placed a “bridging” exercise between each of the couplets, just to allow some well deserved recovery. 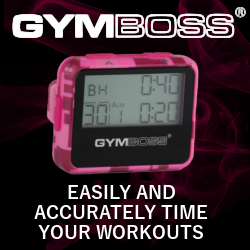 In addition to your Gymboss Interval Timer, you will need a mat, a stability ball and/ a rolled up towel, a bench or chair. The first video below shows the workout as I did it. As usual I have provided alternative workout breakdowns and demonstrations for beginners and intermediates to follow on the second video. I appreciate any feedback on this new method, as I was unsure whether the previous demonstrations were enough. Can you let me know which method you prefer?? Set your timer for 4 cycles of 20/20. Each couplet will be performed 4 times, in a row! The “bridge” exercise between each couplet has set reps, so you won’t need to reset your timer. Couplet 1 – Start timer and complete 4 continuous rounds. Couplet 2 – Start timer and complete 4 continuous rounds. Couplet 3 – Start timer and complete 4 continuous rounds. Couplet 4 – Sorry for this one :/ – Start timer and complete 4 continuous rounds. Given the continuous nature of each super-set there was no time to record my reps, but I cannot lie and pretend that my numbers were great, as I stopped and started quite a bit, especially in couplets 1 and 3, as my shoulders were on fire LOL. The whole thing took me about 30 minutes, I think, but I was doing camera duty too (that’s my excuse anyway). Set your timer for 8 cycles of 10 seconds rest and 20 seconds effort. You will still be completing 4 continuous rounds of each couplet, only you will have SOME recovery time. Because of the added rest, each couplet will last 4 minutes, and will be like Tabata Interval set up. Again there are set reps for the “bridge” exercises. NOW REPEAT THE WHOLE THING AGAIN, OR CHOOSE 2 COUPLETS TO DO AGAIN. Set your timer for 8 cycles of 20 seconds rest and 20 seconds effort. Complete 4 rounds of each couplet before moving on. Each “bridging” exercise has set reps.
NOW EITHER REPEAT THE WHOLE THING, OR CHOOSE 1 COUPLET TO DO AGAIN.